There are various important components that assist greatly with success in Scottish salmon fishing and the next few paragraphs will focus in on a few of the more important points that go a long way to achieving the desired objective in this highly popular Scottish rural pursuit. Understanding the game you're playing and managing your own expectation levels to achieve a thorough full water coverage day is probably the most important factor for success in this business. It is so important that your excitement and expectation levels are kept in check and don't burn you out in the first few hours when a slow start to the day is experienced which happens more often than not. You need to channel your thoughts and engergies to last the entire day as this is a business of opportunities that will appear throughout the course of the fishing day on any salmon beat and often when you're least expecting it so 'consistency of approach' that will last the entire fishing day is very important. Don't let your head go down at any point and making sure you're fly is in the water and fishing properly is so important as 'effective water coverage' is indeed the business you are in. A deep underlying confidence with faith in your salmon fly and the pre-determined depth you've chosen to swim it at is what you must have along with an understanding that sooner or later that fly will find itself in front of a taking fish if you maintain effective water coverage. Emotionally you can be out on a limb in salmon fishing so a deep routed confidence is crucial to maintaining your consistency of approach. The most effective mind set I've found is to keep your persistency levels high and your expectations levels low throughout the full course of the fishing day. 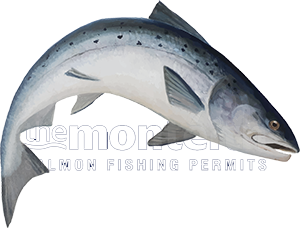 The hours of searching for a salmon will be instantly erased from your mind with the first initial tug on your fly reel when you finally find a cooperating fish. The important thing up to that point is knowing that your faith levels in your fly and the way it is swimming are running high. Salmon are true masters at sneaking up on you when you're mind is a million miles away so don't think too much about the task in hand and let your mind wander as often as you like which it will do naturally when you're out in the beautiful highly scenic environment of the Scottish salmon river. A split second decision from a salmon can truly cap a memorable day on any river so pursue that moment with quiet confidence all the way to the last cast of the day.